View of the Ruins of Chelmsford Church which fell on the 17th Jany 1800.
bl.uk > Online Gallery Home	> Online exhibitions	> King George III Topographical Collection	> View of the Ruins of Chelmsford Church which fell on the 17th Jany 1800. View from the interior of the ruinous Church of St Mary the Virgin in Chelmsford. This late medieval parish church was well proportioned to suit the size of Chelmsford, which was at this time a prosperous market town. 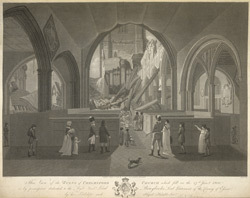 It replaced an earlier church, and was built by the Bishop of London John Kemp in the fashionable Gothic Perpendicular style Unfortunately as these pictures show, in 1800 the roof and a lot of the fabric had collapsed. They were brought down by grave digging close the walls. It was later rebuilt by architect John Johnson, who had built the nearby Shire Hall.